The Nestle Enteral Feeding Spike Adapter, Model #12163246, is anchored in advanced science and research. Nestle Healthcare Nutrition offers nutritional solutions for people with specific dietary needs related to illness, disease states or the special challenges of different life stages. The Nestle Enteral Feeding Spike Adapter allows an enteral closed system container with SpikeRight PLUS port to be connected with a universal enteral spike set or a SpikeRight spike. 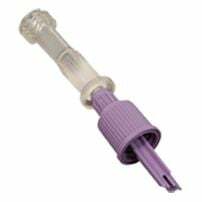 Use only if an enteral spike set compatible with the SpikeRight PLUS enteral-specific port is not available.